1. Whisk together all the ingredients for the sauce in a small glass jug, then set aside. 2. Heat a wok over a high heat until smoking and add the rapeseed oil. 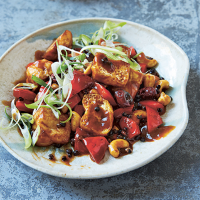 Add the Sichuan peppercorns and dried chillies and stir-fry for a few seconds, then add the tofu cubes and stir-fry for 1 minute until the tofu is seared at the edges. Add the Shaohsing rice wine or dry sherry, then the red pepper and cook for just under 30 seconds. 3. Give the sauce a quick stir, then pour into the wok and bring to the boil. When the sauce has reduced and is thicker and slightly sticky, add the peanuts or cashew nuts, followed by the spring onions and cook for 1 minute. Stir to mix everything together well, then transfer to a serving plate and serve immediately. This recipe was first published in Wed Jan 30 11:26:57 GMT 2019.